You will have the chance of discovering the most exclusive places of Granada and the Alhambra, thanks to our official guide, an expert in architectural interpretation and cultural heritage, a great companion that has the key to open you special places, usually closed to the public visit, and open just in this visit, to show you the secrets hidden on them. The architectural work of the Alhambra is admirable, not only for its beautiful plasterwork and stucco or the monumentality of its paneled covers, but it also involves a complex engineering project, whose final results are not always visible. The use of the water in the Hispano-muslim culture represents one of its foundational pillars, both practical and hygienic as well as religious or aesthetic, something we see reflected in the presence of the many fountains flowing throughout the complex of the Alhambra. Therefore, the Hispano-muslim rulers always paid great attention to get that access to running water was easy for all its people, creating infrastructures to make this possible, and establishing direct relations between the fortress and the city of Granada. With this visit, called "The Conquest of the Water", we try to reveal the most unknown parto of Islamic culture. 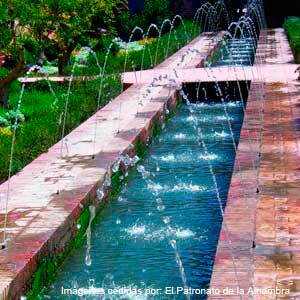 With the help of our official tour guide, we'll invite you to discover the hydraulic system that is structured and flows within the red walls of the Alhambra and its direct environment. Obtaining water, the rudimentary but exquisite running of the fountains or the ditches distributing are some of the aspects that reveal to the visitors all their hidden visits. Discover inside a reduced groups some of the meanings of Muslims and Christians and learn how it was channeled and "conquered" more than six centuries ago. 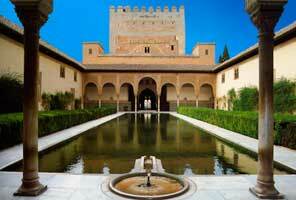 Sometimes, for indications of the Patronate of the Alhambra, the order of the visit could be modified, as well as some places cannot be visited, so in case this happens the agency will change the itinerary to another ordered by the Patronate, without reducing the duration of the tour. Offered on Thursdays and Saturdays. Duration 4 hours, aprox. (from 9.30 to 14.00). - Tickets and access to every place included in the itinerary. Due to the duration and the lenght of the tour, we recommend the usage of comfortable shoes and the intake of enough water during the visit. You will receive an email with the confirmation of your payment and the voucher of the visit. You must print this voucher and handle it to your guide before the beginning of your visit, and you will receive your ticket for the monument. This voucher is the proof of your purchase and no other proof will be accepted to make the guided tour. If you want to modify or cancel your reservation, please, contact us through our Custom Service form. We recommend you to o to the Meeting point 10 minutes before the start of the tour. This typo of visit focueses on specific aspects of the Alhambra. 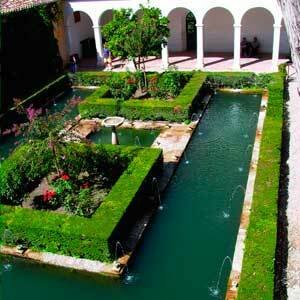 Therefore, the ticket does not give acess to the full area of the Nasrid Palaces, the Fortress or the Generalife Gardens, but, on the other hand, it includes some areas that usually are closed to the public visit inside the monumental complex and other selected places in Granada.